Take a Word theme for this week is SPRING. I'm offering this to my friends up there who are longing for Spring. The doll is built from bits and pieces by Rebecca Mcmeen, as well as the background. Drew Barrymore lent me her gorgeous face. Font is Edwardian Script. 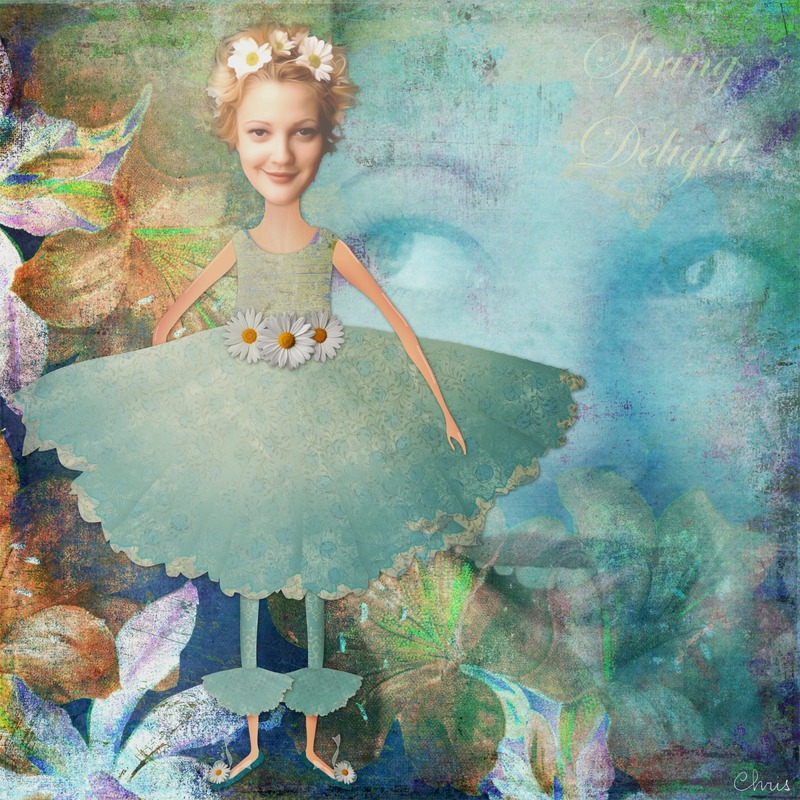 She's one delightful doll, Christine, beautiful Spring background, love the colours! I wonder if she is a fairy without wings ;) Creative, nice collage, Christine. Oh how beautiful, I love Drew Barrymore and Rilke too! A really beautiful spring creation. Oh what a delight this is, Miss Chris, it's full of joy with a nice pop of humour too. Thank you, by the way, for thinking about us 'up here' still waiting for Spring. Bravo. I love this piece, Christine! So soft and beautiful. Beautiful pastel colors in this one, Chris. I LOVE her ruffle-bottomed tights! This one made me smile! I adore the style of dressing of your spring princess Chris! The colors are awesome and the off center is perfect! This is superb, Chris. Drew Barrymore does have a lovely face and she looks very much at home in her fairy costume. Bravo. this is so cute! love your whimsy doll. This is a delight soo cute.